These Premium 100% Plastic Playing Cards are among the very best values you'll find anywhere. Plastic Club Casino Playing Cards feature a mirror image design of the Hoyle "Club Casino" circular logo. 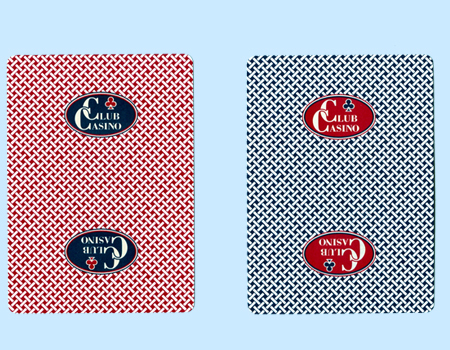 Club Casino Plastic Playing Cards are available in Red/Blue two-deck sets, and they feature regular index numbers and pips. For more information or volume pricing on Club Casino Plastic Decks, please contact us at 1-800-233-0828. Sale - $4.61/Set. Was $10.95. Save BIG!